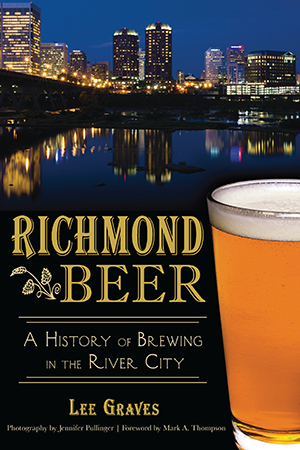 The story of beer and brewing in Richmond is a reflection of the well-documented and revered place the River City holds in the nation's history. English colonists imbibed together on the banks of the James River. During the Civil War, a brewery was adjacent to a hospital. Beyond historical brews such as the Krueger Brewing Company and Richbrau beer, Richmond is no stranger to the vibrant craft beer culture thriving across the nation. Area brewers, including Hardywood Park Craft Brewery, Legend Brewing Company, Midnight Brewery and Strangeways Brewing, make Richmond a beer lover's paradise. Grab a pint and join author and beer columnist Lee Graves as he recounts the frothy history of Richmond beer. Lee Graves has been an award-winning beer columnist for the Richmond Times-Dispatch since 1996. His work has been syndicated nationally, featured in numerous publications and can also be found on www.leegraves.com. A graduate of William & Mary, Graves is deeply involved in the brewing and beer community of Richmond. He currently lives in Richmond with his wife, Marggie. Mark Thompson is co-founder and master brewer of Starr Hill Brewery in Crozet, Virginia. Since 1999, the brewery has developed a reputation for excellence, winning numerous national and international awards for its beers, and Thompson has become a prominent figure in the craft brewing industry. Currently, he serves as chairman of the Virginia Craft Brewers Guild.